Widespread international coverage of an insurance scam in Nepal that involves some helicopter companies, private hospitals and trekking agencies has hurt the country’s image abroad, and impacted an industry just recovering from the 2015 earthquake. Nepal’s government, in responding to an AFP exposé of malpractice earlier this year, may have made things worse with a slapdash report that accuses everyone of being in on the scam. There is evidence that some trek organisers, hospitals and helicopter companies in Nepal connived to create fake medevacs of trekkers, or sometimes deliberately made hikers sick, so that they could collect and share insurance compensation. 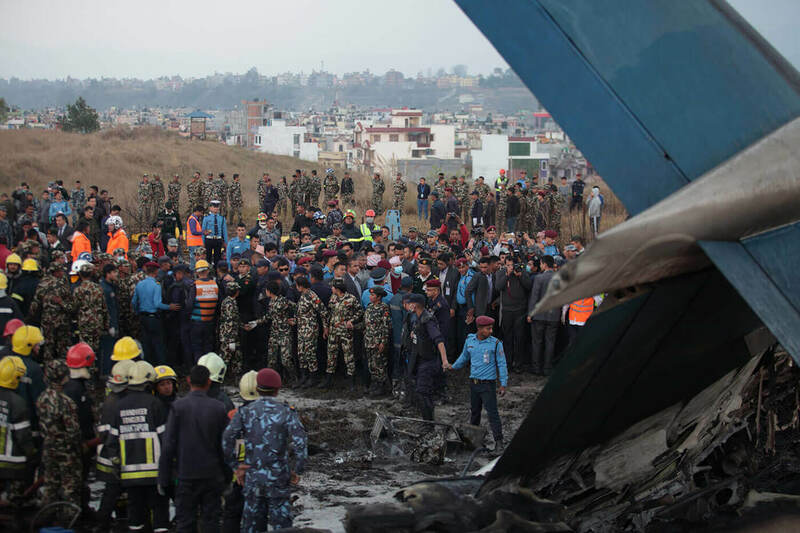 Insurance watchdog Traveller Assist claimed its own investigations showed that 35% of the 1,600 helicopter rescues in Nepal this year were fraudulent, costing up to $4 million. The company said it had intercepted and stopped 160 of the claims. The cost was serious enough for some international travel insurers to give the Nepal government till September to do something about it. Reacting to the ultimatum, the Ministry of Culture, Tourism and Civil Aviation formed a fact-finding committee last month to investigate how insurance companies had been defrauded with fake medical bills and fake rescues, with kickbacks sometimes being shared with trekkers who pretended to be sick. Only four pages of the aforementioned report were leaked to the media, naming 13 companies allegedly involved in the scam, including three helicopter operators, four hospitals and eight trekking agencies. It went so far as to make the impractical suggestion that only the Nepal Army conduct helicopter mountain rescues. “The investigation itself needs to be investigated, the findings were as fake as the scams that were probed,” stated Rajendra Bahadur Singh of the Airline Operators Association of Nepal. He added that airlines were never asked about the questionnaires they filled out or data provided about their rescues. “What kind of investigation was this, without any follow up, only conclusions based on assumptions?” Singh asked. There is speculation the investigation was conducted to target selected companies while letting the real culprits off the hook. A trekking company founder Nepali Times spoke with feared the process had tarnished companies which are not after kickbacks as guilty, while influential people with political protection would walk free. Ethical trekking outfits, transparently-run hospitals and helicopter companies that follow rules appear to have all been lumped together with the fraudsters. “The rot goes right to the top, so they will make a few examples of the small fries, while the big fish will keep doing what they were doing,” the source said. One of the hospitals named in the committee report is CIWEC Hospital which mainly treats expats and tourists in its clinics in Kathmandu and Pokhara. Medical director Prativa Pandey hosted a media briefing recently to clarify her hospital’s stand. “All we have done is take care of patients who come to us or who are sent to us by insurance companies, Nepal should be proud of its helicopter rescue pilots who put their own lives at risk to save lives,” Pandey said. Pilots and their machines are working at their performance extremes in the topography and high altitude of the Himalaya. Last week, Capt Nischal KC, a veteran of many daring mountain rescues, was killed with five others when his chopper hit a forested mountainside in Nuwakot. Pandey said the report has implicated parties, sullying hospitals like hers, with the mainstream media labelling everyone guilty without due process. Releasing only parts of the report, implicating certain companies and hospitals and not being consistent with facts, was a trial by media “based on assumptions and predjudice”. The negative publicity has already led to some cancellations by trekking groups booked for the autumn season. It is not just the companies but Nepal’s international image that has been smeared. Trekking agencies in Pokhara say they have been getting cancellations from groups already booked for the autumn season. More than 10% of the 900,000 visitors to Nepal last year went trekking. With such a large number on the move, altitude sickness, infections and accidental falls are frequent. 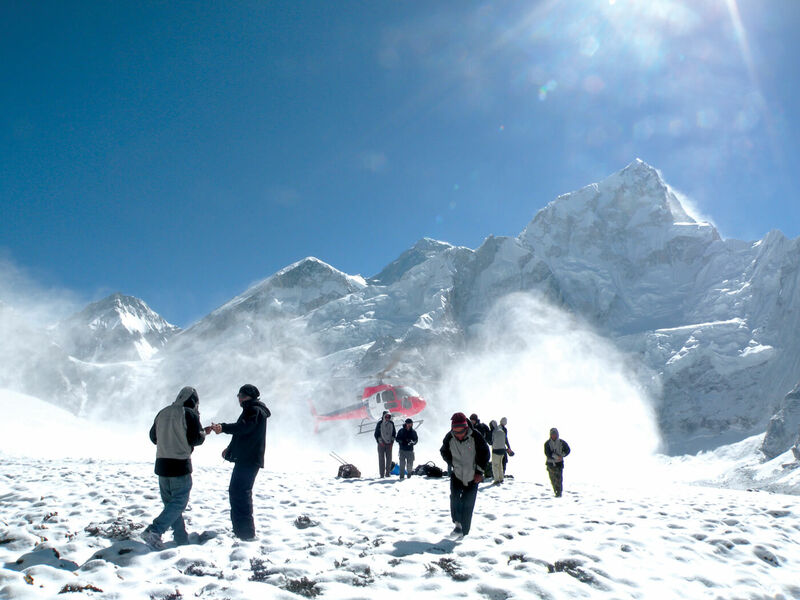 Since trekking routes are usually remote, hikers in genuine emergencies are evacuated by helicopters to Kathmandu. Nepal has an advanced rescue network. Most rescued trekkers are really sick. But it is often difficult to determine whether hikers suffering from Acute Mountain Sickness (AMS) will get better by descending or if they need to be medevaced. Since there is room to fudge it, greed and competition has brought together some private helicopter companies and hospitals to cheat with false claims. Pandey is a physician at CIWEC, which treats many sick tourists, and says the threshold for heli-evacuation has decreased substantially since domestic aviation was commercialised. Before 1990, all rescues were performed by Royal Nepal Army. Studies have shown that there has not been an increase in the proportion of trekkers suffering from AMS, but the numbers of rescues of trekkers with altitude sickeness has soared. Most symptoms can be alleviated by descent, while more serious pulmonary or cerebral oedema require emergency rescue. 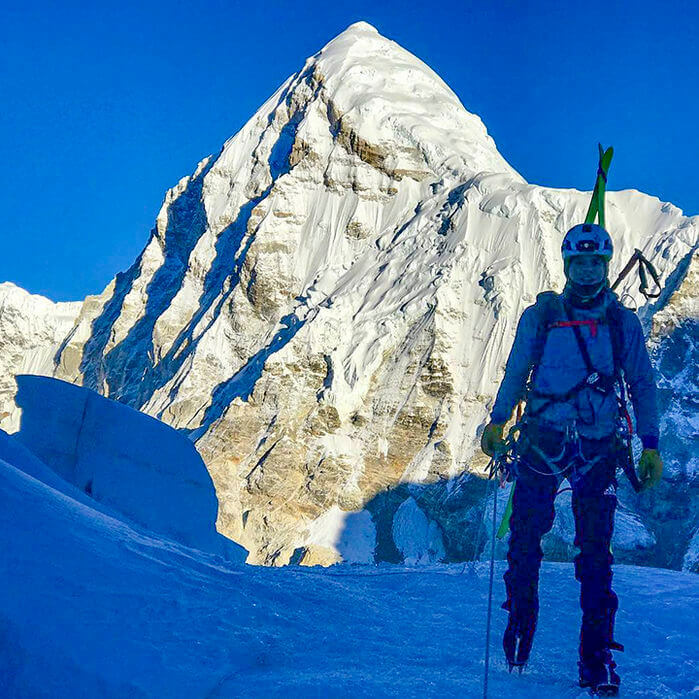 However, a Nepali Times investigation showed that there are trek leaders who insist on a chopper rescue at the slightest complaint of headache or nausea. Some helicopter companies are partly owned by private hospitals in Kathmandu, and the fake insurance claims are shared, and kickbacks offered. 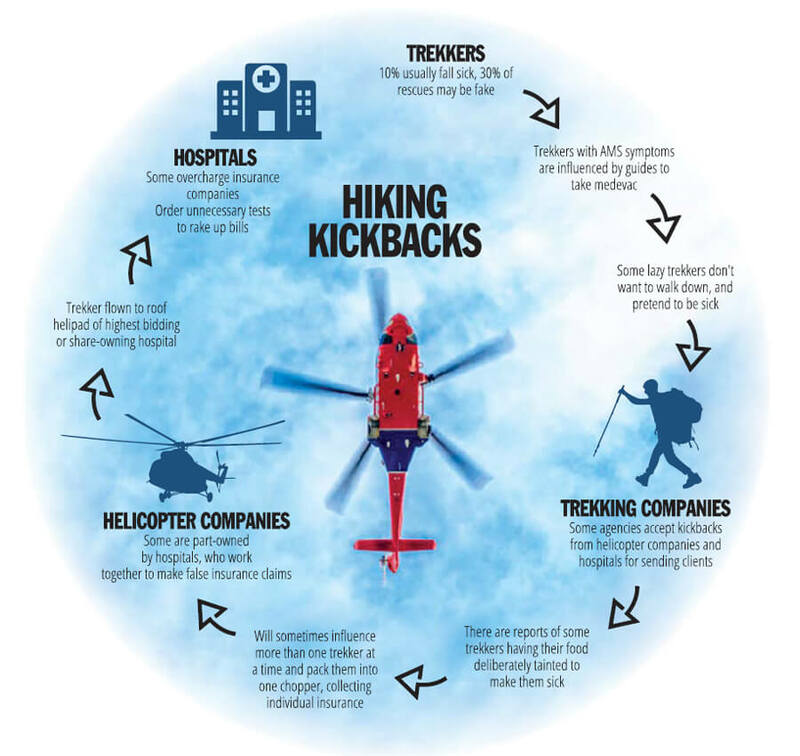 One trekking agent who helicoptered a genuinely sick client from Khumbu to a well-known private hospital in Kathmandu last year was taken aside and offered an envelope containing Rs150,000 in cash – he was told it was his ‘commission’ for bringing the patient. This spring, a trekking group leader on Island Peak ordered a helicopter from Kathmandu to evacuate a sick trekker. The pilot brought along 10kg of unsolicited chicken as goodwill payment for the rescue. Trekking groups say such ‘bribes’ are standard operating procedure. There are horror stories about some trekking guides deliberately making clients sick by contaminating their food. But there are also lazy trekkers who do not want to walk back, so pretend to be sick and are helicoptered out with the active connivance of their agency. Stiff competition, undercutting in the tourism business, and the slim margins for helicopter companies, has made insurance scams too tempting for some to resist. Private hospitals offering kickbacks to helicopter companies is just an extension of their standard practice of paying ambulance drivers who bring patients to the emergency. There have been many heroic rescues in the Nepal Himalaya. Airlines have invested in high performance helicopters that can make rescues up to 6,500m. Many hikers and mountaineers would have died if the option were not there. During the 2015 earthquake, 140 climbers were rescued from above the Khumbu Icefall on Mt Everest. In 2010 three Spaniards were winched up by long-line at 6,950m on Annapurna IV. Such necessary rescues are now in jeopardy because of a few unscrupulous operators. The government, which should regulate the business, has botched its investigation by implicating everyone, but punishing no one. 1 Trekkers too lazy to walk back the same way down pretend to be sick, and with active connivance of their trekking agency, order a helicopter ‘rescue’. 2 Trekkers with mild symptoms of altitude sickness are persuaded or pressured to be choppered out to Kathmandu. 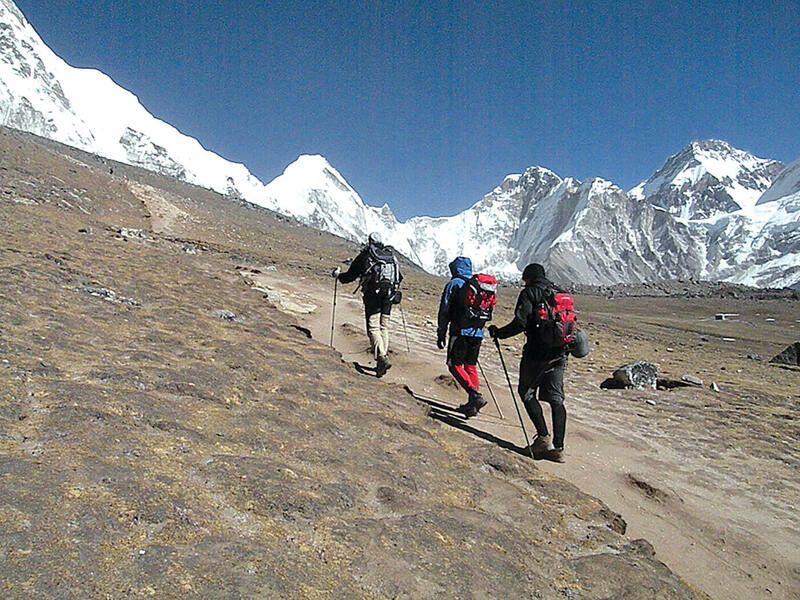 3 Unscrupulous trekking groups contaminate food, or force group to climb faster than recommended so they get sick. 4 Hospitals offer kickbacks to trekking groups and lodges which fly patients to them. Some hospitals own shares in helicopter companies and vice-versa. 5 Overcharging for helicopter rescues. 6 Hospitals ordering unnecessary tests so billing is heftier. 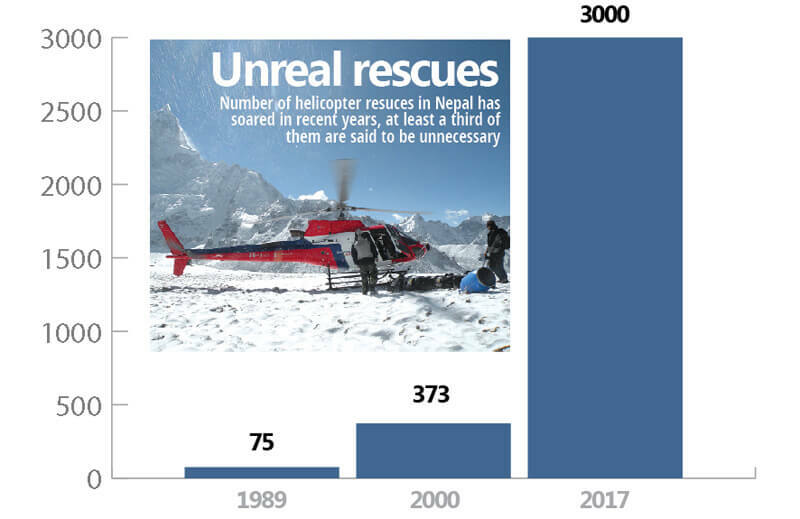 Allow me to add some information to readers about the development of unnecessary rescues in Nepal. When climbing near Langtang in 1976, the lack of dependable communication required the support team to be able to physically carry someone out (or, at least, to a lower altitude) rather than waiting too many days for a helicopter to come. The required extra level of self preparedness was not guaranteed, as it meant more expenses and many groups were unwilling or unable to do that. ‘exercise cycle’ to power the telegraph and request heli-aid from Kathmandu and, somehow to guarantee payment from a dying patient (I covered that with assistance of my colleagues). The flight, with weatherissues, happened only 4 days later. It was, literally, borderline survival for the trekker. As from the mid 1990s, heli-rescues began to be shared by the military with private operators and new helicopters were enabled to go to higher altitudes. This period inchoated a gradual change in high altitude rescues. Like the advent of the cross-country ski patrol in Canada, many users of the hills now felt it less necessary to be as prepared as before, as rescues were relatively easy to obtain. Rescue flight insurance was now de rigeur and, as with most policies and regulations in any country or company, some people devise ways to circumvent and misuse facilities and services. picture have been or can be present. In one of my consultancies, with the Ministry of Health and Ministry of Tourism and Civil Aviation in 1994, I had been requested to look into and report on the establishment of a comprehensive rescue/medical system in tourist areas. One of my recommendations at that time was improved and mandatory training for local guides, monitoring of credentials of foreign leaders, clarity on the decision-making process when there is both a local as well as an expatriate leader. And ethics must be an element of any training with the tourism industry.